The audio file featured below is my interview with Jean Bach who directed the 1994 film, A Great Day in Harlem, nominated in 1995 for an Academy Award for Documentary Feature. The documentary explores the story about the famed photo titled A Great Day in Harlem taken in 1958 outside a brownstone in Harlem and featuring 57 jazz musicians of the era, including such artists as Dizzy Gillespie, Charles Mingus, Marian McPartland, Count Basie, Gene Krupa, Thelonius Monk, and many more. 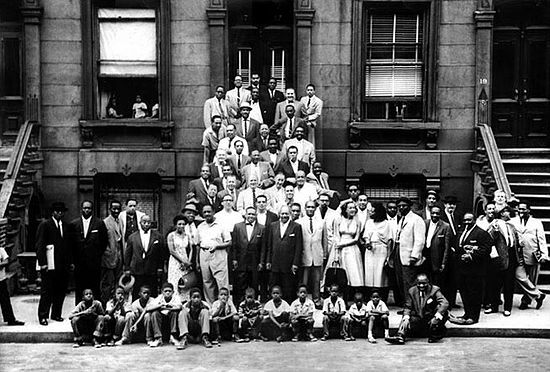 The photo, by Art Kane, who at the time was on assignment for Esquire magazine, is considered to be an important visual document in the history of Jazz. The photo was taken at approximately 10 in the morning on August 12, 1958. One can only wonder what force of nature got so many jazz musicians up so early. In this interview from 1995, Bach discusses the background behind the documentary and some insights about the photo. * The picture, A Great Day in Harlem, is presented here in support of an educational feature on a non-revenue generating blog that is entirely non-profit and accepts no advertising. As such, it meets the definition for Fair Use as established by the U.S. Copyright Office. Rare Video: Poet James Dickey, "The Moon Ground"